The toughest part about being Jabba the Hutt’s slave isn’t so much the endless servitude, but more so the fact that he only provides clothing for the harsh and unforgiving desert climate of Tatooine. The problem is (and Return of the Jedi never showed this), Jabba enjoys taking frequent trips to other planets that have different terrains, and he always brings his slaves with him. You can see how this might be a problem if you’re a slave girl in a skimpy bikini and you suddenly find yourself on the barren (and freezing) ice world of Hoth. Luckily, we have something that’ll let you cover up a bit while still meeting Jabba’s questionable dress code: this Womens I Am Bikini Leia Tank! It’s the perfect way to look like everyone’s favorite galactic princess during her time in the clutches of the nefarious Jabba the Hutt, without having to sacrifice modesty (i.e. leaving something to the imagination). And it may not be an arctic coat, but this awesome shirt is a great alternative to a bikini when you’re not at the beach and the weather’s just a little bit chilly. It’s got all the instantly recognizable markings of Princess Leia’s slave outfit with none of the complications that typically come with swimwear. 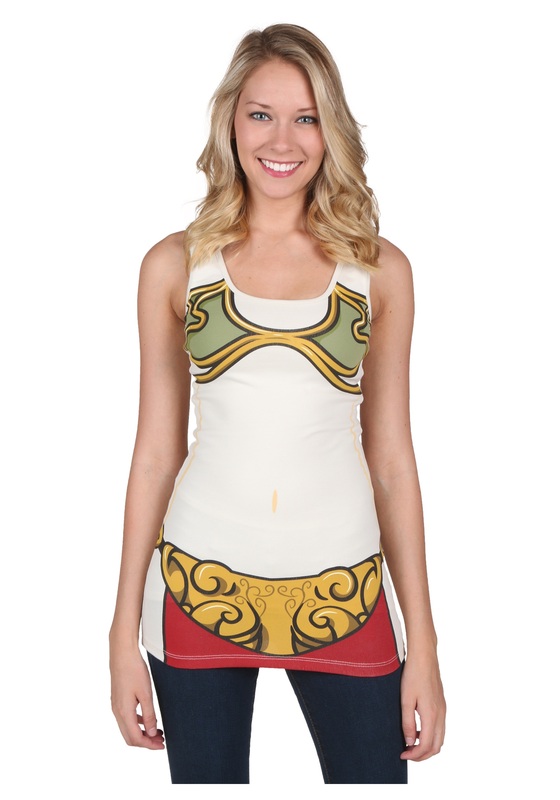 The Womens I Am Bikini Leia Tank makes a great Star Wars-themed costume, whether you’re going for humor or you just need a last-minute Halloween outfit. And who says you only have to wear it once a year? The shirt is a great addition to any Star Wars fans’ daily wardrobe!